Who decides that there is “no adverse effect” of a sewage treatment plant on a sacred and culturally important place? Deadline for comment on the desecration of the Afton Effigy Mound is Thursday, September 1, 2016, at 4:30 PM (not midnight). Here’s the pdf that includes information on how to submit comments. In the end it is the Dakota people themselves–and other Native people who care about the place–who make such decisions. And this decision cannot be made on archaeological grounds alone. As seen in the case of the Afton Effigy Mound, it is not the Minnesota State Historic Preservation Office which makes such decisions. 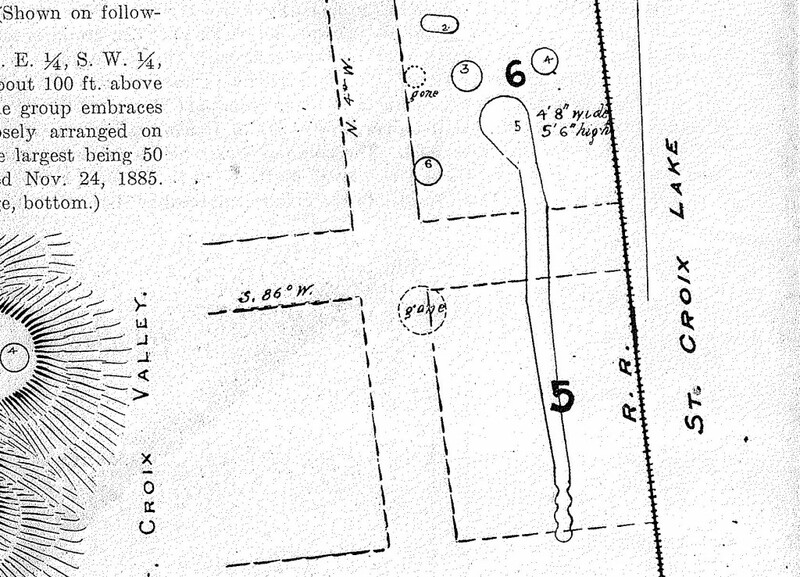 The MNSHPO made its recommendation that it might be true that there was “no adverse effect,” but in the end it was the Minnesota PCA–the agency pushing the sewage treatment project within and adjacent to the ancient mount–which made this “determination.” But this was an archeological determination. It was about the effect of the project on the mound as an archaeological site. It did not take into account the effect of the mound as a sacred and cultural place. What is the effect of building a sewage treatment project adjacent to and within a sacred and culturally important place? Not the effect of the project on an archaeological site, but the effect on that intangible sacredness and cultural importance contained in the mound and the area around it. This is not a question either the MNSHPO or the MPCA is interested in answering. But it is a question Dakota people have to answer for themselves. And the answer they give–like the the answers they have given in relation to many such development projects in the past–will have implications for generations to come. Throughout the history of Minnesota as a European-American place there are many examples to demonstrate how Native sacred and culturally important sites should be acknowledged, preserved, and respected, and, conversely many examples of how such sites have been ignored, desecrated, and despised. These examples do not all fit the common stereotypes of who has protected sacred sites and who has not. While Native people have often fought for the protection of such sites, there are examples of individual Native people and tribes letting desecration happen, even collaborating in it, and there are other examples of Non-Native people seeking to carry out an enlightened and unexpected stewardship, something that could be a good example for other White people. 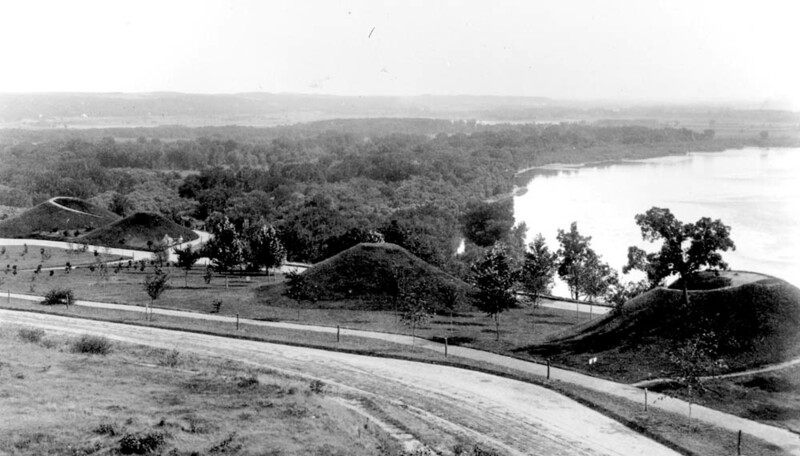 The mounds in St. Paul’s Indian Mounds Park have come to receive an increasing amount of protection and acknowledgement for their sacredness, after a period of initial desecration and neglect. It is not known if a similar degree of acknowledgement and protection will ever occur for the Afton Effigy Mound. INDIAN GRAVE. D. J. Peabody of Afton steadfastly refuses to budge a 10-foot high Indian mound in his backyard. “I could use all that fill for the rest of my backyard, but I wouldn’t want anyone digging up my grave,” the 60-year-old retired mechanic says. He now runs a hobby shop next to his home. Both Peabody, who has lived in Afton since 1924, and his father-in-law Frank Squires, another long time resident firmly believe the mound was the head of a 150-foot-long fish-shaped Indian burial ground. Time, erosion, floods, and cloudbursts have wiped out its contours excepting the head. At least one tomahawk and a number of arrowheads have been found in the mound, Peabody says. A number of years ago several workmen uncovered two skulls from the body of the fish. Peabody is grading the mound slightly so that he can plant grass and keep it mowed. Given the way in which the Afton Effigy Mound began to be desecrated after Peabody died, and given what may happen with the sewage treatment facility advanced by the Minnesota Pollution Control Agency today, D.J. Peabody was clearly a rare and exceptional resident of Afton. But Peabody was not the only White resident of Minnesota who sought to carry out an enlightened stewardship over Native sacred and culturally important sites. An early history of the town of Winona, Minnesota (History of Winona and Olmsted Counties, 276-277) tells the story of a “settler” named John Burns who came to live on a plot of land in a valley adjacent to the later town of Winona, having received permission to settle there from Wabasha’s band of Dakota, prior to their enforced removal to a reservation on the Upper Minnesota River in the 1850s, and their later exile from the state of Minnesota in 1862. One must also acknowledge the many more accounts of mounds leveled, destroyed and generally obliterated. It is no wonder that the Town of Afton now seeks to desecrate the Afton Effigy Mound. Rather than paying D.J. Peabody his due, following his example of good stewardship and that of John Burns in Winona, the now seeks to erect a highly visible evidence of the sorry legacy of White Minnesota as a place where sacred sites are not given the protection they ought to receive, where paradise is torn down to put up a parking lot. It is a shameful history. And now it will be Afton’s shame too. Do Dakota and other Native groups in and around Minnesota agree that the sewage treatment project to be built in and around Afton, Washington County Minnesota, will have “no adverse effects” on the Effigy or Rattlesnake Mound located in the heart of Afton? Now is the last opportunity for them to speak up for the mound, at least if they were officially consulted by the Minnesota Pollution Control Agency during planning for “Afton’s proposed infrastructure improvement projects”–sewage treatment facility. Comments by consulting parties must be received by the MPCA by the deadline of September 1, 2016. Go to https://www.pca.state.mn.us/water/f… for more information. The major reason for comment is the recent Final Determination of the Minnesota Pollution Control Agency that the project will result in “no adverse effects to historic properties” (the Afton Effigy Mound). Consulting parties, that is those tribes and other entities who were allowed to consult over the last few months, will have until that deadline of September 1, 2016, to comment on this finding. These consulting parties include the following Sioux or Dakota communities or reservations: Shakopee, Upper Sioux, Lower Sioux, Prairie Island, and the Sisseton Wahpeton Oyate. Other Native groups include the Mille Lacs Band of Ojibwe, the Leech Lake Band of Ojibwe, the White Earth Nation, and the Minnesota Indian Affairs Council. While members of the public are not given the opportunity to comment, it is certainly within the power of the public to contact these consulting parties and urge them to submit a comment by the deadline. Three hundred and thirty years ago, give or take a year, on June 29, French visitors to the homelands of the Dakota people, traveled for the first time into the Minnesota River or Wakpa Mni Sota, as it was known to the Dakota. There were five Frenchmen in the group, one of them named Pierre-Charles Le Sueur, who had just come into the region of the Dakota. The Frenchmen named the river after the saint whose feast day was June 29: St. Pierre or St. Peter. 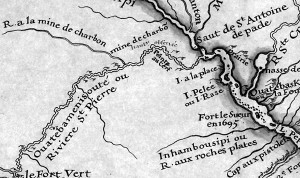 Pierre Le Sueur mentioned that entrance of the French in the Minnesota River many years later, in conversations with French map makers in Paris, while explaining the French name of the river. He said that the river was given the name because it was “discovered some time ago on St. Peter’s [St. Pierre] Day and because of the five of us at the time, a Jes[uit] & 4 adventurers, there were 3 named Peter [Pierre].” Le Sueur gave no year for this event except to say that he first came to the Dakota country in 1683. Before this date, no Frenchmen had mentioned the Minnesota River. Even Father Louis Hennepin who traveled up the Mississippi River and the tributary Rum River all the way to Mille Lacs Lake in 1679 and 1680, failed to mention going by the mouth of the Minnesota River. This may be because of the location of the large island Wita Taåka, now known as Pike Island, concealed the mouth of the river. Hennepin and other Frenchmen may have thought the water flowing around the island was simply a backwater on the Mississippi. The Minnesota River or Rivière St. Pierre, known to the Dakota as the Wakpa Mni Sota (or in Pierre Le Sueur’s transcription, the “Ouatebamenisouté”) is shown at left on Guillaume DeLisle’s 1702 map of the region. Regardless of the merits of this description of the river’s geology, Pierre Le Sueur’s account shoots this theory out of the water. As the editor of Zebulon Pike’s journals, Elliott M. Coues states, it was “too good to be true” anyway, though Coues also argued against the idea that the river was named after the saint at all, suggesting other more famous 17th century Frenchmen named Pierre or St. Pierre. Warren Upham, in his work Minnesota Geographic Names (page 3), was closer to the truth when he said that the French name was given in honor of Pierre Le Sueur himself. It is clear that he was only partly right. For more information on Pierre Le Sueur’s accounts of his time among the Dakota, see Gwen Westerman and Bruce White, Mni Sota Makoce: The Land of the Dakota, published by MHS Press in 2012. The DeLisle map above is in the collections of the Library of Congress. This article was first published on this site in January 2010. The information is also discussed in the new book Mni Sota Makoce: The Land of the Dakota. Although the National Park Service’s final EIS for the Coldwater/Bureau of Mines property in Hennepin County, Minnesota, contains the statement that “no historical documentation of American Indian use of Camp Coldwater Spring has been found,” (repeated five times in the final EIS, beginning on page 72), there is actually ample evidence of the presence of Dakota, Ojibwe, and other Native people at Coldwater Spring. One example is a birch-bark scroll sent by Dakota leaders to invite their Ojibwe counterparts to meet with them to make peace at “Cold Spring” in the summer of 1820. The scroll is part of a detailed history of such diplomacy at Coldwater Spring. Although it is not known if the original birch-bark message has survived, Henry Schoolcraft included an engraving based on it in his six-volume compendium Historical and Statistical Information Respecting the History, Condition, and Prospects of the Indian Tribes of the United States. According to Schoolcraft the original birch-bark message was left near the mouth of the Sauk River (in between present-day Minneapolis and St. Cloud), a place bordering Ojibwe country, where it was expected Ojibwe leaders would be able to find it. Schoolcraft, who visited the area with the expedition of Michigian territorial governor Lewis Cass, described this message and later took it back with him to Washington. After seeing the message, Schoolcraft and company continued on down the river to Coldwater Spring. Inter-tribal diplomacy between Dakota and Ojibwe is one of the biggest untold stories of early Minnesota history, particularly as it relates to Coldwater Spring. In the years that following the events of 1820, Coldwater Spring was the habitual camping place of the Ojibwe who came to visit Fort Snelling, the Indian agency, and the nearby Dakota communities. Ojibwe and Dakota traded, danced, and participated in ceremonies there for many years. It is likely that the site was also used for this purpose prior to the arrival of the Americans. Dakota-Ojibwe diplomacy was recorded long before the creation of Fort Snelling. Although the Indian Agent Lawrence Taliaferro liked to take credit for the diplomacy, in many cases the impetus for it came from the Native leaders themselves, particularly those who had mixed Dakota-Ojibwe ancestry through intermarriage that had been going on for hundreds of years. For Native leaders Taliaferro provided an important intermediary to continue efforts their people had been carrying out for generations. Agent Taliaferro’s first effort at diplomacy occurred at Coldwater Spring in the summer of 1820, when the military encampment switched from Cantonment New Hope to Coldwater Spring. Taliaferro arrived at St. Peters early that summer and may have encouraged the Dakota who sent the invitation to come to Coldwater Spring. In his journal Taliaferro did not record a narrative of what occurred that summer, but he did leave a record of presents given to Dakota leaders starting in June 1820. The invitation sent by the Dakota leaders shows the extent to which they themselves were instrumental in bringing about the diplomacy. Along with the engraving in his multi-volume work, Schoolcraft gave a written explanation of what the figures on it meant. The scroll containing this inscription . . . as obtained above St. Anthony’s Falls, on a public expedition. . . . It consisted of white birch bark, and the figures have been carefully drawn. Number 1 [at top left], denotes the flag of the union;–Number 2, the cantonment, then recently established at Cold Spring on the western side of the cliffs, above the influx of the St. Peters [Mdote or Bdote]. Number 4 [the figure holding the sword and wearing a hat] is the symbol of the commanding officer, (Colonel H. Leavenworth,) under whose authority a mission of peace had been sent into the Chippewa country. Number 1 is the symbol of Chakope, or the Six, the leading Sioux chief [wearing what looks like a round peace medal], under whose orders the party moved. Number 8 is the second chief called Wamade-tunka, or the Black Eagle. The symbol of his name is number 10 [that is, the figure on the far right at bottom, a black dog, which means this is a reference to the chief of Black Dog’s Village, the closest village on the Minnesota River above Fort Snelling]. He has 14 lodges. Captain Douglas, who had begun the study of this ‘bark-letter,’ as it was called thought this symbol denoted his descent from Chakope. Number 7 is a chief, subordinate to Chakope, with 13 lodges, and a bale of goods (Number 9), which was devoted, by the public, to the objects of the peace. The name of Number 6, whose wigwam is Number 5, with 13 subordinate lodges, was not given. The frame, or crossed poles of the entire 50 lodges composing this party, had been left standing on the high, open prairie on the west bank of the Mississippi above Sauk River, and immediately opposite the point of Hornblende Rocks, which results from the figure-alphabet being precisely the same in both [Dakota and Ojibwe]. 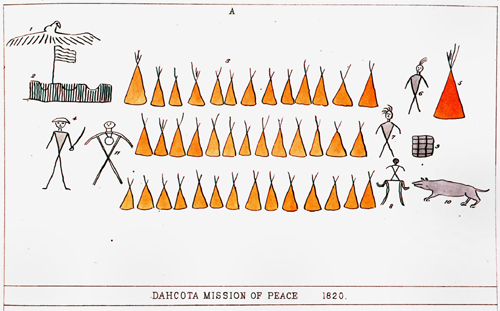 Records of peace ceremonies between Dakota and Ojibwe, such as the one that occurred in 1820 at Coldwater Spring, abound in historical and ethnographic sources. The anthropologist Ruth Landes in her work on the Prairie Island Dakota (1968: 85-86), records a traditional account of a peace ceremony said to have occurred between the Dakota and Ojibwe or as she spells the name, the Ojibwa. The story says that the Dakota chief was named Shakopee and had a village in an area near the Ford Factory in St. Paul and near Minnehaha Falls in Minneapolis, a place that would have been close to Coldwater. But the story also says that the event took place at Shakopee, which may be the result of confusion in translation or in remembering the tradition. In fact the story recalls many ceremonies that occurred near Fort Snelling and at Coldwater. The story told that an Ojibwa chief had sent word that “his people were coming to make peace with the Sioux.” The Dakota chief gathered all his villages to meet the Ojibwe. The people came from the east and west. Some Ojibwa arrived in the advance of the chief; four came with their chief; next day the whole body of Ojibwa arrived and camped at a distance from the Sioux, totaling about 150 men, women, and children. The chief and his companions stayed with the Sioux until the other Ojibwa arrived; then the chief and his men returned to their people. The Ojibwa chief with some chosen men walked forward in a line parallel to the Sioux encampment. The Sioux chief likewise advanced to the Ojibwa. The Sioux lit his redstone pipe [carved starkly and decorated with dyed braids of porcupine quill and downy feathers] and handed it to the Ojibwa chief for a puff. The latter handed his pipe equally choice in style and finish, to the Sioux, inviting him to puff. Each man received back his own pipe after pointing that of the friendly enemy to the six directions. The Ojibwa chief gave his pipe to the Sioux guards facing his camp in a parallel line; and the Sioux chief reciprocated with the Ojibwa guards. Each chief, having returned to his own men, shook hands with the other, saying that they would never war against each other. Through our oral traditions, our history, recent and older, we know that the falls which . . . came to be known as Minnehaha Falls, that there was a sacred place, . . . a neutral place for many nations to come, and that further geographically define the confluence of the three rivers, which is actually the two rivers, that that point likewise was a neutral place. And that somewhere between that point and the falls, there were sacred grounds that were mutually held to be a sacred place. And that the spring from which the sacred water should be drawn was not very far, and I’ve never heard any direction from which I could pinpoint, but there’s a spring near the [Midewiwin or medicine] lodge that all nations used to draw the sacred water for the ceremonies. Now that’s in the words of our people of the [Midewiwin] lodge. And the people that are concerned or the people that are identified there are the Dakota, the Sac, the Fox, the Potawatomi, the Wahpeton Dakotas, the Mdewakanton Dakotas, the Meskwaki people as all having used and recognizing and mutually agreeing that that is forever a neutral place and forever a sacred place. That is confirmed in our oral history. And it is difficult even to estimate when the last sacred ceremony was held inter-tribally, but my grandfather who lived to be 108 died in 1942, and I will tell you this, that many times he re-told how we traveled, he and his family, he as a small boy traveled by foot, by horse, by canoe to this great place to where there would be these great religious spiritual events, and that they always camped between the falls and the sacred water place. Those are his words. . . . Within my physical memory, visiting the Prairie Island Dakota Nation as early as the 1940s, there were still elders in that community in the 1940s who were still members of the Midewiwin Lodge along with the Winnebago of Wisconsin. And my memory serves me to say that there was a great dialogue among our people and those of the Prairie Island Community regarding the lodge, and that’s how we have always known this way of life and practice as the lodge, but meaning the Midewiwin Lodge as a system of belief. . . . The Honorable Amos Owens . . . is the last person of that community I ever heard talk about that mutually sacred place, meaning the falls and the spring from which sacred water is drawn, Coldwater. In a book published in 1835, Charles Joseph Latrobe stated that “lodges of the Sioux and the Chippewas encamped near the Reservation, or near the trading houses.” These would have been temporary visits, if only because the Dakota and the Chippewa were enemies unlikely to reside near one another except for brief visits to traders, the Indian Agency, or the fort. The 1820 invitation by the Dakota for the Ojibwe to come make peace with them, along with all the other evidence not included in the final EIS, make clear the inaccuracy of this statement, and of the Park Service’s account of the Native connections to Coldwater Spring. Anyone holding a ceremony at Coldwater Spring, a sacred and culturally important place for Dakota people, is required to get a permit from the local office of the National Park Service office in St. Paul, known as the Mississippi National River and Recreation Area or MNRRA. However as of August 30, 2012, no permits are being granted for ceremonies or anything else at Coldwater Spring, until the spring of 2013 at the earliest. Any violation of this rule or others relating to MNRRA’s regulations may subject the violator to a fine of “up to $5,000 for individuals and $10,000 for organizations, or by imprisonment not exceeding six months, ” as well as being “adjudged to pay all court costs associated.” No exceptions appear to be available for the Dakota people whose original place of creation includes Mni Owe Sni or Coldwater Spring. Events need to be regulated to ensure there is no resource damage and to ensure that events do not conflict with each other. Gatherings need to be regulated to ensure there is no resource damage and to ensure that events do not conflict with each other. NOTE: The NPS is not issuing any special use permits for Coldwater Spring until late spring of 2013. The land and wetland restorations are so new that even small events could harm them. The NPS will review this position in the spring to determine whether it is okay to open Coldwater Spring to permitted events. Could the National Park Service be a fit guardian for the Gettysburg Battlefield if it announced publicly that it did not accept the belief that a profoundly important battle took place there, one that was a turning point in the history of the Civil War and indeed for the history of the country, and that because of this belief the battlefield should be approached with great reverence? What if the Park Service announced that it understood that the battlefield had some contemporary importance among Civil War re-enactors, but that the battlefield was also important among nature lovers, polo players, and others with various agendas and that the Park Service had to serve all its many stakeholders and that the role of the battlefield as a public park open to everyone would adequately serve these many constituents? It is hard to imagine that this would ever be possible. Yet the Park Service’s Twin Cities branch, the Mississippi National River and Recreation Area or MNRRA, is now managing a public park located at Coldwater Spring, a site considered to be a sacred place and traditional cultural property by the Dakota people, from whom the spring was obtained in the Treaty of 1805, while maintaining that it does not accept the cultural and historical connection of the Dakota to the site. The record of MNRRA and its employees has, for the past six years, made clear that it does not and will not ever respect the cultural heritage of the Dakota. The full record of the Park Service’s biases against the Dakota–and its unfitness to manage Coldwater Spring–has been discussed in great detail on this website over the last six years. Perhaps the earliest inkling of Park Service attitudes was revealed in what follows a story first published online on September 13, 2006. For those who do not know the issues involved this is a good place to start. Every minute, for thousands of years, 70 gallons or more of cool, pure water have gushed from Coldwater Spring, on the west bank of the Mississippi River just upstream from where the Minnesota flows into the Mississippi. It is a part of the area’s complex watershed, a remarkable feature of an area the Dakota people consider to be the center of the world. Historic sources disclose that the Dakota have considered and do consider springs to be sacred places, but Coldwater Spring, now located on the Bureau of Mines (BOM), Twin Cities Campus property in Hennepin County, Minnesota, is not, according to the National Park Service, a place of traditional cultural importance—a “traditional cultural property” or TCP—for Dakota People. This Park Service opinion was revealed in late August 2006, in a statement rejecting the report of an outside consultant which had found that Coldwater spring is a TCP. Contrary to the consistent statements of Dakota people and Dakota communities, other Indian people, and other experts, the National Park Service will admit only that the spring has “contemporary importance to many American Indian people.” The Park Service has declined to explain much about the announcement, including any clue about how it reached that conclusion. Nonetheless, the announcement appears to be a direct challenge to the historical and cultural beliefs of Dakota people in Minnesota and elsewhere and to the sovereignty of their tribal governments. It is difficult to know whether this was intentional or merely the result of bad judgment. On August 18, 2006, the National Park Service sent out a Draft Environmental Impact Statement (DEIS) and supporting documents describing the cultural, historic, and environmental characteristics of the Bureau of Mines (BOM) property and considering the effects that a variety of actions might have on the property. The Bureau of Mines property contains the place where Coldwater Spring comes out of the ground, where its waters are gathered in a pool and where these waters begin to flow to the Mississippi River. One of the reports attached to the DEIS was a study (Ethnographic Study) analyzing whether Coldwater Spring is a TCP, the term used for sites of places of traditional importance under the National Register of Historic Places (NRHP) criteria. “Sacred site” means any specific, discrete, narrowly delineated location on Federal land that is identified by an Indian tribe, or Indian individual determined to be an appropriately authoritative representative of an Indian religion, as sacred by virtue of its established religious significance to, or ceremonial use by, an Indian religion; provided that the tribe or appropriately authoritative representative of an Indian religion has informed the agency of the existence of such a site. Coldwater Spring reservoir in winter, in the 1880s. Original in the Minneapolis Public Library. Given this special definition under federal law, a place of cultural importance to Dakota people might not be considered a TCP by the federal government but could be a sacred site, or visa versa. Dakota and other Indian people hold Coldwater Spring to be important because of their religious and cultural beliefs and their history. The spring and the Bureau of Mines-Twin Cities Campus property are in federal hands today because in 1805, at the mouth of the Minnesota River, two Dakota leaders from nearby villages signed a treaty in which they gave the U.S. government, as represented by Lieutenant Zebulon Pike, the right to use the area around the mouth of the Minnesota to build and support a fort. Article 3 of the treaty provided that the Dakota people would continue to have the right to “pass, repass, hunt or make other uses of the said districts, as they have formerly done, without any other exception, but those specified in article first [relating to the use of land for a military post].” The meaning of this provision has not yet been determined by a court of law, but it should be clear to anyone who hopes to make use of the Bureau of Mines property that this right, and other possible rights, may be perpetual, even though Dakota people have been barred from the property for long periods of their history. From the 1805 to the 1850s the Dakota did have access to Coldwater Spring. As described by some of the Indian consultants and in historical documents, Coldwater Spring was part of a neutral ground, a place where many Indian groups came for treaties and ceremonies. Ojibwe leaders camped at Coldwater Spring when they signed the Treaty of 1837, the first sale of their land in present-day Minnesota. A number of individuals of mixed Dakota, Ojibwe, and European ancestry lived around the spring. The wife of Benjamin Baker, the most important trader located at the spring, was Ojibwe, as were the wives of some of Baker’s employees. Marguerite Bonga, of African and Ojibwe descent, was married to Jacob Falstrom, a Swedish blacksmith. Nancy Graham, the daughter of Duncan Graham and a Mdewakanton Dakota woman named Ha-za-ho-ta-win, was married to Joseph Buisson. Specific examples of Dakota people using the water from Coldwater Spring, or any spring at all for that matter, are difficult to find in written sources. [However see the later research that showed that the Dakota did come to the spring, as discussed in my new book Mni Sota Makoce: The Land of the Dakota.] Does this mean that Dakota people never came to the spring, did not understand its importance, or did not value it? One might as well ask whether it is possible that the soldiers at Fort Snelling did not understand the importance of the spring because there are so few records of soldiers actually going there. In historical documents there are actually very few direct references to people drinking water at the spring, even though we know that it was crucial to the support of the fort and to the historic settlement located around it. Springs were important but they were a part of the landscape that was seldom mentioned in historical documents. Few whites wrote about the Dakota beliefs about springs in general or Coldwater Spring in particular. Perhaps the most important written information about the spring is found in the work of Gideon Pond, a missionary who thought of Dakota religious beliefs as being superstitions, but who still recorded them with detailed though sometimes incomplete descriptions. Springs for the Dakota were “breathing places of the wakan,” or the sacred and mysterious, including such beings as Unktehi, “the God of the waters.” Unktehi was specifically associated with the hill just west and north of Coldwater Spring, Taku Wakan Tipi, “the dwelling place of the gods,” known to the soldiers at Fort Snelling as Morgan’s Mound. In historic times the area between Coldwater Spring and Taku Wakan Tipi was a wetland, nourished by seepage from Coldwater Spring—or from Coldwater’s own sources—around Morgan’s Mound. Archaeologist Robert Clouse’s 2000 survey of the Bureau of Mines site showed deeply buried wetland soils at the north end of the property, further evidence of the persistent presence of Unktehi (Clouse Report, p. 68). The significance of Coldwater Spring for Dakota people today comes in part from the traditional reverence that springs have had for Dakota people. But Coldwater Spring is an especially important spring because of its association with Taku Wakan Tipi and with the larger Mdote—or more accurately, Bdote—Minisota area, an area with a number of linked sacred places, including Pilot Knob or Oheyawahi, which was also associated with Unktehi in Dakota beliefs. Mdote Minisota is the place of Dakota creation, the center of the world, which helps explain the rich number of Dakota sacred places in the area. In fact, though Mdote refers to the mouth of a river, there is no reason to believe that the place of creation is limited to the water at the mouth. An early French source uncovered by the anthropologist Carolyn Anderson describes the first woman coming out of the ground on the plain between Mdote and St. Anthony Falls. This means that the sacred area of Dakota origins is much larger than the literal mouth of the Minnesota River. Until recent years no sites of traditional cultural importance to Dakota people in Minnesota have been included on the National Register of Historic Places. The first was Boiling Springs in Scott County, nominated by archaeologist Scott Anfinson and placed the Register in December 2002. This site had the advantage of being fairly discreet and uncontested; although it is important, it lacks the profound importance of the areas around Fort Snelling. Oheyawahi or Pilot Knob in Dakota County was nominated in 2003 and determined to be eligible in January 2004 by the Keeper of the National Register. It was the first Dakota site within the Mdote [Bdote] Area to be acknowledged in this way, although other locations have been discussed. While the boundaries of the Fort Snelling Historic Landmark and District areas include some sites of Dakota importance, documentation on these areas includes little, if anything, that acknowledges Dakota history, culture, beliefs, traditions, or even presence. Several consultants have suggested that a Mdote Cultural District, embracing the many sites of importance to the Dakota and other tribes, should be documented fully and nominated, but no actions have been taken to do so. Because of the lack of Dakota sites on the National Register, and because of the profound importance of the Mdote area, and because of the tragic history of 1862 and its aftermath, special sensitivity is required by all who deal with properties located there. Such sensitivity appears to have been applied in documenting and analyzing Coldwater Spring by the firms Summit Envirosolutions and Two Pines Resource Group, under contract with the National Park Service as part of the current Bureau of Mines environmental review process. As a result of this evaluation, Coldwater is recommended as being significant at a statewide level as a TCP associated with the Dakota communities in Minnesota. The spring is recommended as eligible for the National Register under Criterion A for its association with Mdote. The spring is also recommended as eligible under National Register Criterion C as representative of the type of natural springs (many of which have been destroyed or which are no longer accessible) that figure significantly in Dakota traditional practices and are important for the continued maintenance of their cultural identity (Ethnographic Study, p. 79). There is a consensus that the boundaries of Coldwater Spring include not only where the water flows from the rock wall, but also the source of the spring and the location where the spring water finally deposits into the Mississippi River (Ethnographic Study, p. 93). The National Park Service recognizes that Camp Coldwater spring and reservoir located on the former Bureau of Mines property holds significant contemporary importance to many American Indian people. However, the evidence presented in this report does not meet the criteria of the National Register of Historic Places for determining them eligible for the Register as a Traditional Cultural Property (TCP). The study offers substantial background information about Dakota Indian Life around the confluence of the Mississippi and Minnesota rivers and about Dakota traditions related to springs and water. However, little evidence is provided that relates directly to the site specific use of the Center [BOM-Twin Cities Campus] property or Coldwater Spring. After thoroughly reviewing the evidence provided in the report the National Park Service has concluded that neither the Center nor Coldwater Spring meet the specific criteria in the National Register to designate the area as a TCP. However, it is clear that the spring has significant contemporary cultural importance to many Indian people, and the spring is already a contributing element to the Fort Snelling National Historic Landmark and the Fort Snelling National Register of Historic Places District. In recognition of this contemporary cultural importance and the contributing element factors, an alternative will be included in the EIS that would provide protections for the spring and reservoir (Ethnographic Study, Appendix B). Kyral’s words are condescending, suggesting that although the federal government rejects the Dakota communities’ claim to the spring as a historical and cultural feature and in the process rejects the history and cultural traditions on which it is based, the Park Service will try to protect the spring because it is part of a site important for, among other things, its role in colonizing Minnesota and sending the Dakota into exile in 1863. The area’s place in Dakota history is not significant; its white history is. The irony of this juxtaposition is evidently lost on the Park Service. The stated position is that of the National Park Service based upon an agency internal review. In other words, the Park Service wished to make clear that The Agency—meaning anyone from the Park Service Director Fran Mainella, Regional Director Ernest Quintana in Omaha, some park superintendent in Hawaii, or one or two local staff in Minnesota including, possibly, Superintendent JoAnn Kyral, Project Manager Kim Berns, historian John Anfinson, cultural anthropologist Michael J. Evans, or even MNRRA’s Singing Ranger Charlie McGuire—had decided that Coldwater Spring does not meet the criteria as a traditional cultural property for Dakota people. The Park Service wanted everyone to know this but was unwilling to provide reasons, and use of the term “internal review” suggests that the Park Service would claim an exemption from the Freedom of Information Act to anyone who requesting documentation of the process. Why should a finding without explanation or justification be taken seriously? In the wider world of historical study, you are expected to support your theories with facts and arguments. In such a world the “determination” of the Park Service, presented without evidence or argument, would not be taken seriously and it would have little effect. In this case the Park Service is supervising an EIS process, and the determination is actually a pre-determination, one that biases a process that is supposed to be an open and honest one. An EIS is not merely the discussion of the consequences of various actions, but a compilation of information presented as facts. By presenting information in certain ways, a government agency can pre-determine the result it wishes to achieve. In rejecting the recommendation of its consultants on the TCP question without actual discussion of the information or issues raised, the Park Service has raised questions about the consultant’s facts and analysis without actually presenting any useful alternative facts or analysis. the author concluded that neither the spring nor associated features are independently eligible for the NHRP. However, she did conclude that Camp Coldwater Spring does contribute to the significance of the Fort Snelling National Historic District, the Fort Snelling National Historic Landmark, and the Old Fort Snelling State Historic District (DEIS, p. 81). The Henning conclusions, which are contained in a skimpy half-page analysis in the Henning report—in contrast to the 21-page discussion in the Ethnographic Study—are highly questionable. There is a wealth of information contained in the Henning report and in other sources that would show that Coldwater Spring is independently eligible for the NHRP, were the Park Service disposed to undertake such a examination. During the course of that study, some participants identified springs as a general category of culturally of culturally important resources due to spirit entities that inhabit such water sources, and the ceremonial use of water for various purposes. Although no historical documentation of American Indian use of Coldwater Spring was found, the oral traditions and histories collected during the investigation suggest that natural springs like Coldwater Spring are associated with sacred healing. Camp Coldwater Spring is currently used by some members of federally recognized Dakota and by Ojibwe communities, and by other American Indians as a source of water for ceremonies (DEIS, page 81). It is important to note the distinction made here between “historical documentation” and “oral traditions and histories.” One would have thought this kind of ethnocentric distinction—which holds written evidence to be more important than oral tradition—had long been discredited in applications of National Register criteria. Only someone with a confirmed bias would suggest that this is a fair presentation of the evidence in the Ethnographic Study. Coldwater Spring is not just a spring among springs, all of which may be sacred to the Dakota, but it is the most visible surviving spring, one that happens to issue in part from Taku Wakan Tipi, the very place where Unktehi was said to reside. The Park Service knows these facts but chooses not to mention them, for reasons the agency has not shared. Camp Coldwater Spring was also identified as important in relationship to the Mdote Minisota or the confluence of the Minnesota and Mississippi Rivers. While the confluence is not located within the area of the proposed actions, the interviewees stressed the importance of considering Camp Coldwater Spring within this larger context (DEIS, p. 82). Not content to draw conclusions about Coldwater Spring opposite to those reached by its own consultants, the Park Service here presumes to draw its own boundaries for a Dakota place of traditional importance, without any particular evidence and without consulting with Dakota people. Evidence in the Ethnographic Study and in other sources contradicts this statement, extending the boundaries of the place of Dakota creation usually described by the term Mdote a great distance away from the actual mouth of the Minnesota River. The Park Service chooses to ignore its own evidence. One can only assume that for the Park Service’s BOM agenda to be achieved, it is convenient for Coldwater Spring to be entirely independent from the place of Dakota creation. The primary American Indian communities that have been identified as having an association with the area surrounding the spring are the Mdewakanton Dakota, who currently reside at the federally recognized Lower Sioux Indian Community; Prairie Island Indian Community; Shakopee Mdewakanton Sioux Community; and Upper Sioux Indian Community (DEIS, p. 82). As you are aware, the Coldwater Spring and the area at the meeting of the Minnesota and Mississippi Rivers have held significant cultural and practical importance to Indian people for thousands of years. We once again state our support of our spiritual leaders that the Coldwater Spring is a spiritual and cultural sacred site (Ethnographic Study, Appendix G). Referring to later letters from tribal leaders, Park Service conveniently fails to mention that the leaders had previously declared that Coldwater Spring was a “sacred and cultural site,” reporting only a later statement that “Coldwater Spring holds significant cultural importance to the Dakota People” (DEIS, page 28). Similar bias occurs when the Park Service reports the statement contained in a letter from the chairman of the Iowa Tribe of Oklahoma, representing descendants of the people who were in the region of Mdote [Bdote] several hundred years ago. Marianne Long, director of tribal operations in 1999, wrote: “Camp Coldwater is a sacred site for the Iowa Tribe and other Native American groups” (Ethnographic Study, Appendix G). The Park Service says it attempted to contact the Iowa Tribe about these statements but “no response was received from the tribe” (DEIS, p. 29). You asked me something in a different way. . . . And see, that’s a European concept. If they don’t get an answer, well then they’ll ask another way. They can’t accept what they’ve been told. They want to change it . . . . So we don’t change nothing. Same with our ceremonies, we don’t change them. Our ceremonies come through dreams and visions. Our way of life is conducted . . . through dreams and visions. We don’t change it. We don’t have that right. It is not of our making. Thomas F. King literally wrote the book on traditional cultural properties, in National Register Bulletin 38, entitled “Guidelines for Evaluating and Documenting Traditional Cultural Properties,” the report that originated the term. Since then King has written a number of other books dealing with such places. King has repeatedly noted the proclivity of federal agencies to argue with Indian people about the meaning of sacred and traditional places. King maintains that government agencies could save time and money simply accepting the beliefs of Indian people and moving on to negotiate with particular groups about the effects of federal actions. In this case, however, Park Service, unable to find a consultant who agreed with its belief that Coldwater Spring was not a traditional cultural property, has simply decided to veto the findings of its consultant. That, of course, has happened before with federal agencies.In Places that Count: Traditional Cultural Properties in Cultural Resource Management (p. 142), King states that one of the best quick TCP studies was written about Chequamegon Bay by John Anfinson, then a historian with the Army Corps of Engineers in St. Paul. King writes that in the 1990s “Anfinson spent a couple of days talking informally with tribal members and captured the essentials of the bay’s traditional significance in a half-dozen page memorandum.” The Corps was not satisfied with his report, and apparently, according to King, Anfinson was not either. Two years later the Red Cliff and Bad River Bands of Chippewa paid Thomas King several thousand dollars to write a TCP study. King himself observes that his report says virtually the same thing as Anfinson’s, only in more words. Anfinson was still with the Army Corps in St. Paul in November 1999, when he received a call from Michelle Heller of the Advisory Council on Historic Preservation. At this time a coalition of Indian people, environmental groups, and many others were seeking to stop the construction of Highway 55 through the Coldwater Area. One point of contention was a set of oak trees, some over 137 years old. Some people said the oak trees were sacred. At the same time the issue of whether the spring or the trees were TCPs had been raised. Earlier in the year the firm of Berger and Associates, working for the Minnesota Department of Transportation (MnDOT), had issued a report that rejected TCP status for the trees but suggested that Coldwater Spring could very likely qualify. At the boundary between development and preservation, Coldwater Spring comes out of the ground between highways 55 and 62 and the lush vegetation alongthe Mississippi River near Fort Snelling, in the former Bureau of Mines Property in Hennepin County, Minnesota. Michelle Heller of the Advisory Council called Anfinson to get his opinion on the Highway 55 issues, perhaps because there had been and would continue to be complaints to the Council on the way in which the historic and historic resources of the area had been treated by MnDOT. Notes of that phone conversationwere kept by Heller or someone else at the Advisory Council and were made available to me in 2001 as a result of a FOIA request:Ms. Heller questioned Dr. Anfinson about his knowledge of the highway 55 project and of the background of the area and tribes. Dr. Anfinson explained that his brother Scott is an archeologist in the SHPO office and they have talked about the case. The Corps has not been involved as there have been no permit issues for the area yet. Dr. Anfinson has experience in dealing with Traditional Cultural Properties (TCPs) since there are 28 tribes in his Corps district. Dr. Anfinson provided some background on the history of the area. He then stated that there is no basis to argue for the four trees or anything in the area as a TCP. He said that the spring supposedly had traditional cultural association but expressed that written evidence needs to be compared to oral testimony in determining whether this is a political move on the part of tribes. Dr. Anfinson has been using bulletin 38 in his determination of what constitutes a TCP though he believes that this bulletin needs to be reworked. He explained that what constitutes a community needs to be defined. For example he asks, “Do eight or ten people out of a tribe of 100 constitute a community?He also questioned what would be considered as an adequate level of evidence and states that these things need to be defined by the National Register of Historic Places. He stated that the issue of the spring is a National Register question and suggested that we talk to Carol Schull [the Keeper to the National Register]. He believes that the evidence should be weighed to determine whether it constitutes a community interest to some Native American community. He doesn’t believe that the evidence is there to support them. He further went on to explain that this issue has been embarrassing to the Native American community because of the large amount of protesting with the lack of evidence to support the claim. Whereas the Bureau of Mines Closure Team has consulted with the Upper Sioux Community, Lower Sioux Indian Community, Prairie Island Indian Community, Shakopee Mdewakanton Community, and the Iowa Tribe of Oklahoma which may hereafter be referred to in this MOA as “concurring federally recognized tribes,” and they have declared the area around the Mississippi and Minnesota River confluence, specifically including Camp Coldwater Spring, culturally and historically important and have been invited to concur in this MOA. Perhaps for purposes of reaching an agreement that all parties would support, this statement does not include the information that these federally recognized Indian groups also called Coldwater Spring a sacred place. Still the agreement acknowledges aspects of Dakota beliefs about the traditional importance of the spring. Having negotiated this agreement and knowing what he knows about the practice of history, John Anfinson would not likely suggest to the Park Service that a “Drop Dead” strategy on the idea of Coldwater as a TCP was a good idea. Rather, the impetus for the Park Service’s stance must have come from someone so thoroughly steeped in bureaucratic methods and with little knowledge of the way the discipline of history works as to believe that the conclusion of a consultant can be rejected simply because someone at an agency says so. Perhaps Anfinson or someone else could have explained to the Park Service how counterproductive this approach is. The Park Service’s stance does little to undercut the traditional cultural importance of Coldwater Spring, but it does do great damage to the Park Service itself. The Park Service’s arrogant assertions about Coldwater Spring have already had and will continue to have a profound and disproportionate effect on the federal government’s environmental review process relating to the disposal of the Bureau of Mines property. As a result it is unclear if the Park Service is capable of carrying out a fair and unbiased environmental review. The best that can be said is that some aspects of the Park Service’s Coldwater Spring agenda are now on the table for everyone to see, instead of being hidden by exemptions to the Freedom of Information Act. Despite these statements it is now clear that the impetus for the Park Service’s stance on Coldwater came from John Anfinson, as was revealed in the next few years by a series of revelations, which were described in later accounts on this website. It is time for the National Park Service to leave Coldwater Spring in Hennepin County, Minnesota. The NPS, or its local branch, the Mississippi National River and Recreation Area (MNRRA), is unfit to manage this sacred and culturally important site which first entered federal hands through the Dakota Treaty of 1805. As reported in the last few days by the Minneapolis Star Tribune, MNRRA has largely completed the removal of the ruined Bureau of Mines buildings that marred the site for many years. Restoration of the landscape is continuing. Now it is time for NPS and MNRRA to leave this property and turn its management over to Dakota people for whom the spring is a sacred site and a place of traditional cultural importance. The condescending words suggested that although the federal government rejected the Dakota communities’ claim to the spring as a historical and cultural feature and in the process rejected the history and cultural traditions on which the claim was based, the park service would try to protect the spring because it was part of a site important for, among other things, its role in colonizing Minnesota and sending the Dakota into exile in 1863. The area’s place in Dakota history was not significant; its white history was. In January 2010, at the end of the environmental review process, the National Park Service announced it would retain ownership of the property for itself, to be used as a public park. The park service issued a press release: “The public’s interest in this site throughout this process illustrates the great significance that the Dakota and so many others attach to this special place . . . We are excited to be the caretakers, and to work with many partners to tell all the stories associated with this place. There are many layers of history associated with this site, from the Dakota to European settlement to 20th century mining technology.” Since the park service had consistently denied any historical or cultural connection of the Dakota to the property, the statement was surprising. Rejecting Dakota traditions and then using them in the agency’s historical interpretation appeared to add insult to injury. Such statements also illustrated the hypocrisy of the Park Service’s entire environmental review process and the emptiness of its consultation with Dakota governments. Even today MNRRA continues to claim that it has consulted adequately with Dakota tribal governments and Dakota people. It lists the many letters it has written to various Dakota tribal groups. Unfortunately MNRRA can provide no comparable record of actual conversations that it has had with Dakota leaders or Dakota people or any case where it actually listened or learned from Dakota people. Consultation through one-sided correspondence is no consultation at all. Clearly, from the beginning MNRRA had one goal only for Coldwater, to make itself the manager of a park. But MNRRA has shown through its cultural biases that it is unfit to manage a culturally significant and sacred place like Coldwater. The agency has finished its work of removing the ruins of the Bureau of Mines. Now it is time for MNRRA to leave. She says she had no idea of the starvation and other privations the Dakota endured that sparked the war. She says her empathy for the Dakota people has grown. And she faults the federal government for failing to meet terms of its treaties with the Dakota. She says the Minnesota Historical Society exhibit does a good job of explaining what happened to all sides including the white settlers in the 1862 war. “I’m grateful that they used the story, because that was my goal … to get the word [out], that these were true, actual people that this happened to,” Klein said. She believes the exhibit achieves that goal. Her hope now is for reconciliation among descendants of the individuals and families whose lives came together so tragically 150 years ago. As I have been writing on Dakota people for the past thirty years, I am very sympathetic to them. However, my intention as a historian and author was never to misrepresent the truth, but rather to find out what the truth was. In the ten years leading up to the Dakota War there was much injustice toward the Dakota in Minnesota. This story has never been adequately told, but the gist of it is in my Little Crow book, published in 2006. Unfortunately, there are few outlets for such books and those who do find it, generally take or leave what they want in it. I was fortunate to team up this year with Sheldon Wolfchild and Bill Weiss regarding a documentary called Star Dreamers, which has three parts, some as yet unfinished. The first part is what is titled “The Indian System.” Sheldon and Bill have utilized me personally and my work a great deal in this film, along with David Nichols, who wrote Lincoln and the Indians. Due to this commemorative year, Sheldon is trying to get “The Indian System” out for public viewing. We have been in New Ulm and also at the Parkway Theater in south Minneapolis. Showings at Fort Snelling are in the works. We are hoping that the MHS will allow a screening at the History Center. 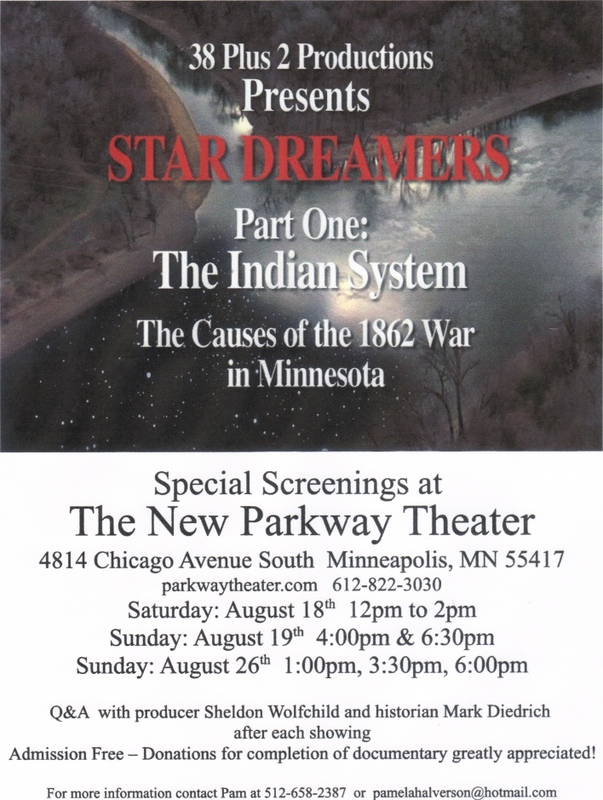 This film does not mince words about how the “Indian System” brought the Dakota to such a low point that they thought it would be better to die in a war than starve to death. I hope that many will urge that this documentary be screened at appropriate venues. We are not insensitive to the innocent settlers who died ugly and gruesome deaths. As is stated in the film, we wish Governor Ramsey had heeded the warnings provided him, to open the warehouse doors and feed the starving Lower Dakota. That said, we name names in this film, and this gives a chance for viewers to assign blame and culpability to key people who were largely responsible for bringing on this war. I am personally sick of the general whitewashing we see in historical writings. Historians need to see that there was a cover-up of the causes of the war. I have spent years trying to unravel this cover-up. I had nothing in mind other than to get at the truth, as far as it can be determined. Please lend your voice to a screening of this film in whatever way you can.